As I’ve mentioned before in this blog, during much of my career I’ve worked as a planner. Just ask my wife or kids—I rarely do anything without working out the details ahead of time. My thru-hike of the John Muir Trail was no different. I had projected mileage for each day, selected areas where I intended to camp, and established waypoints, on my map and in my GPS, to track progress. The first significant deviation from that plan came on day 2. 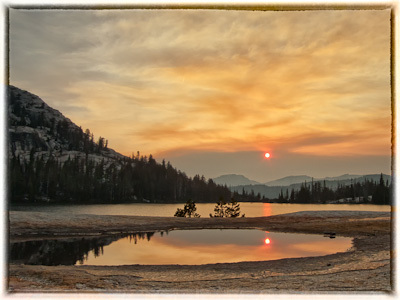 The second night I was intending to camp north of Upper Cathedral Lake, and east of Lower Cathedral Lake, in a small clearing near the slender tributary that connects the two. When I arrived I found that the clearing was pleasant enough, although the surrounding trees were sufficiently close and sufficiently tall to limit the views. The real problem: there was no water. Time to change the plan. After a quick map reconnaissance it was clear I had two choices: retreat to Upper Cathedral Lake, or walk down to Lower Cathedral Lake. I chose the latter, and had one of the most fabulous “mini-hikes” of the entire trip. The trail down was initially fairly steep. I was silently complaining that I would have to climb this same stretch in the morning, before I even got back onto the John Muir Trail. Soon, however, it opened up into a large meadow with several deer. Like most of their brethren I would meet along the trail, this magnificent buck and his rangale of followers completely ignored my approach. Seeing them standing in the long grass, with the Yosemite high country as background, was a sight I’ll not soon forget. A little further along I found my campsite for the night: the solid granite shore adjacent to the eastern side of Lower Cathedral Lake. And what a campsite. Almost immediately I noted that there were no mosquitos! I had picked a spot that was outside the range of the swarms down by the lake, to the west, and the swarms near the meadow, to the east. A gentle north breeze helped keep my area bug-free as well. To the east I had a terrific view of Cathedral Peak, including the sight of a couple of climbers who were summiting the peak as I was setting up camp. The sky seemed fairly clear (except for the smoke from a nearby fire), so, for the only time during my hike, I decided to sleep under the stars. My amateur weather forecasting proved correct, and I was treated to quite the spread of stars as I woke, occasionally, during the night. The best part, however, was the lake. My spot on the eastern shore was the perfect spot for the colorful sunset. What’s the lesson? Embrace change! I am certainly not suggesting that you DON’T plan, but if you need to divert for a good reason, or even a frivolous one, go for it! It may prove to be one of your best experiences. Sunset on Lower Cathedral Lake was spectacular. The extraordinary colors are due to a forest fire in the park. Without my help you have exceeded all of my dreams and expectations. I could not be more proud of you. I camped at this site about a week after you did. It was recommended by some other hikers going to Happy Isles. It was by far the best site during my two weeks on the trail! Thanks for the comment, Marc. It was a great spot, no doubt!